Performance & Reliability Updates for "Github Code Screenshot"
Github Code Screenshot ( or screenshot service ) is a ease way of creating screenshot based on github hosted source code. The screenshot service is hosted here. More about how does it work in the previous post. What features did I add? The contribution describes how I have decreased a total time of generating screenshots from ~5 sec to ~2 sec. How did I implement them? You navigate https://github-shot.herokuapp.com/ and paste your github snippet url. Based on passed github snippet url we do retrive source code using Github API. An internal browser (run on the server) opens https://carbon.now.sh page with your source code passed within custom query params. We are waiting for full page load. 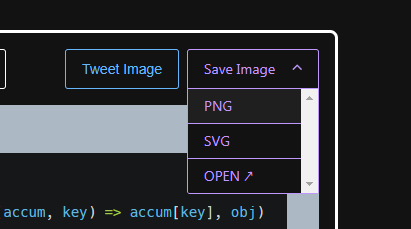 The browser simulates click events: "Save Image" , then "PNG " in order to download a image. The image is downloaded and saved into a local file. File is sent to a user browser. There are a few drawbacks of such approach. First of all, production server has to wait until a https://carbon.now.sh page is fully loaded each time you want to create a screenshot (see 4.). I decided to fork carbon service and run it on the production server, so we do not make external HTTP calls to remote service (carbon.now.sh). So, instead of carbon.now.sh we do use our own copy of the service build from a master branch (yep, it is open-sourced!). page.evaluate allows us to call custom script on the internal browser side. We already know code and lang properties after calling github API, so we can fill a editor with such information. It has a huge impact of a performance of the screenshot service. But there is more. We can also skip step 6. A function api.getCarbonImage returns us a image blob we can instantly pass to a user browser instead of writing, without a need to writing it as a file (and then loading from file in order to send it to a clinet). All of those fixes improves overall performance as well as reliability (due the fact, we are not depending of external carbon.now.sh server). Finally, a homepage view has been updated. You can now generate an embedded code and use it i.e. in steemit.com editor, while composing new Utopian contribution post. Example usecase below. Try it on your own here. At Utopian, we value projects with a clean git history and descriptive commit messages. This is a part of our review process. I saw a commit with message ".". This is not a good practice on open source world. Have a look at this to get better scores in the future. Thank you for your review, @emrebeyler! So far this week you've reviewed 8 contributions. Keep up the good work! I upvoted your contribution because to my mind your post is at least 10 SBD worth and should receive 96 votes. It's now up to the lovely Steemit community to make this come true. Astounding GitHub expansion, Helps a considerable measure overseeing issues between various reports.